We are in the last month of Sale-A-Bration… so make sure you place your orders in time to get those FREE products! Contact me if you have any questions or need help with your order. Today I want to point your attention to the set of 2017-2019 In Colors! As we are nearing the end of the catalog year, items in these colors will start to run out as they retire, and I don’t want you to miss out! Do you have the ink pads? Do you have the re-inkers for those pads? How about some fun ribbon? Thanks for stopping by, and don’t forget to check out my FaceBook page, as I post things there, too. 🙂 My next class on March 16th is listed as an event, and if you have not RSVP’d yet – please make sure to do that so I can have enough supplies ready! 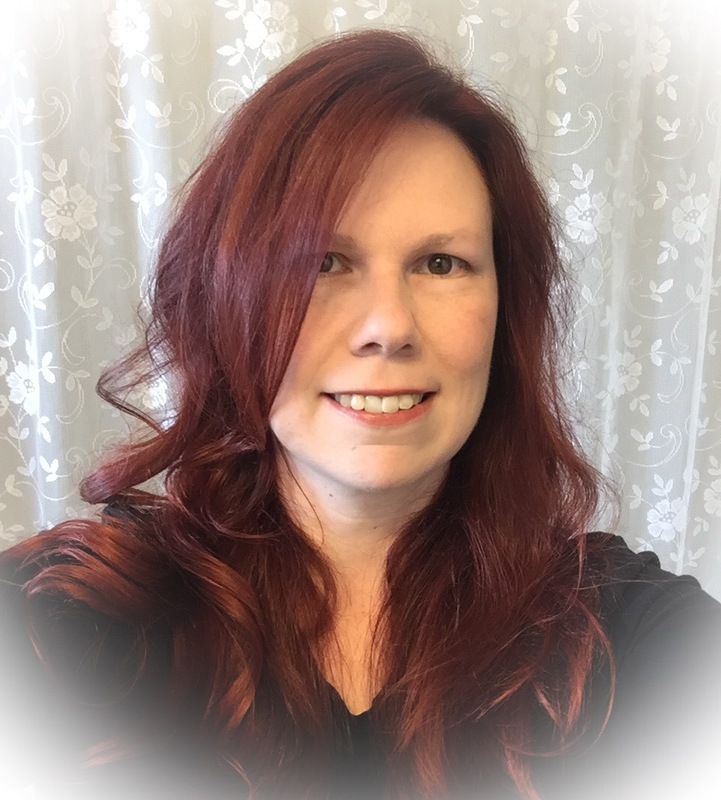 Who are the ‘Blogging Friends’? We are Stampin’ Up! demonstrators all across the U.S. and Canada. Most of us haven’t met in person, but love Stampin’ Up and want to share with you! Please join us on the 1st Friday of every month to see what wonderful things we have created! Each month we’ll have a different theme! This month it’s April Showers! When I hear of April Showers, I think of Springtime and a poem with May flowers. I’m not in any rush to get too far into spring, but I did want to stick with flowers! So my card is going to call Spring our friend, and after the cold weather we’ve had here in Ohio for a while… we will be happy to see it come soon! I love the brightness of the paper, and it has plenty of flowers! I stamped one of the flowers and a few extra leaves, then cut them out using the new coordinating Four Seasons Thinlits. I covered all the Poppy Parade colored flowers with Wink of Stella for some extra shimmer. The Stitched Rectangle Framelits worked great as a frame for the sentiment. That came from the Well Said stamp set, and the Friend thinlit from the Well Written Framelits – which are in a bundle together! 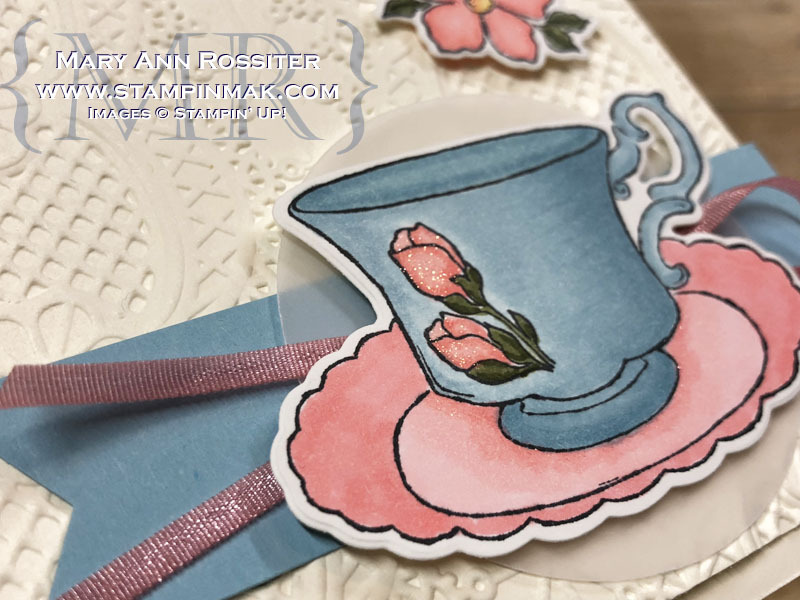 I hope you enjoyed today’s project and don’t forget to check out the other fabulous entries in this month’s hop by clicking on the frog button below!! Don’t forget to check out the other fabulous entries in this month’s hop by clicking on the frog button below!! Who are the ‘Blogging Friends’? We are Stampin’ Up! demonstrators all across the U.S. and Canada. Most of us haven’t met in person, but love Stampin’ Up and want to share with you! Please join us on the 1st Friday of every month to see what wonderful things we have created! Each month we’ll have a different theme! This month it’s Love! The project I have for you today is made with some of the brand new products available in the new Occasions Catalog. There are several beautiful sets and bundles to select from if you’d like to make some Valentine or other Love-themed projects. 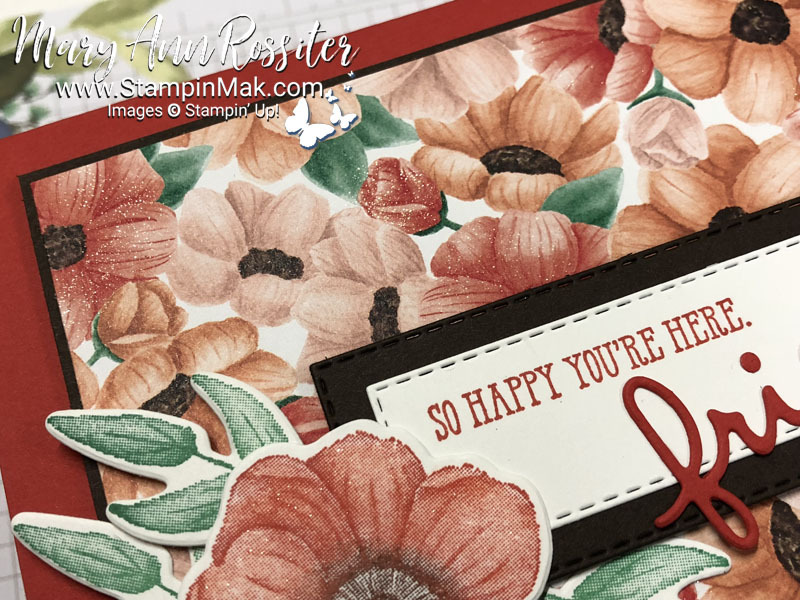 Here I’ve used the All My Love Designer Series Paper (DSP) with the Be Mine Stitched Framelits. The framelits have a variety of heart shapes. I layered a few together to get the outline stitched heart, and the inside solid heart shape. Another coordinating item from the All My Love Suite is the Lovely Lipstick ribbon with stitched edges. It brings such a pretty pop of color that is tied into the DSP in the card. The sentiment is from another new set, Well Said. It fits perfectly in the Classic Label punch. I also used the leaf punch with vellum and the Lovely Floral embossing folder to finish it off. These were not typically colors I would have put together on my own, but having both Lovely Lipstick and Soft Sea Foam in the DSP made it easy to see they worked great together. I hope you find time to put some lovely colors together yourself! Don’t forget we have a new format now with our blog hop, s0 please make sure to check out the other fabulous entries in this month’s hop by clicking on the frog button below!! Who are the ‘Blogging Friends’? 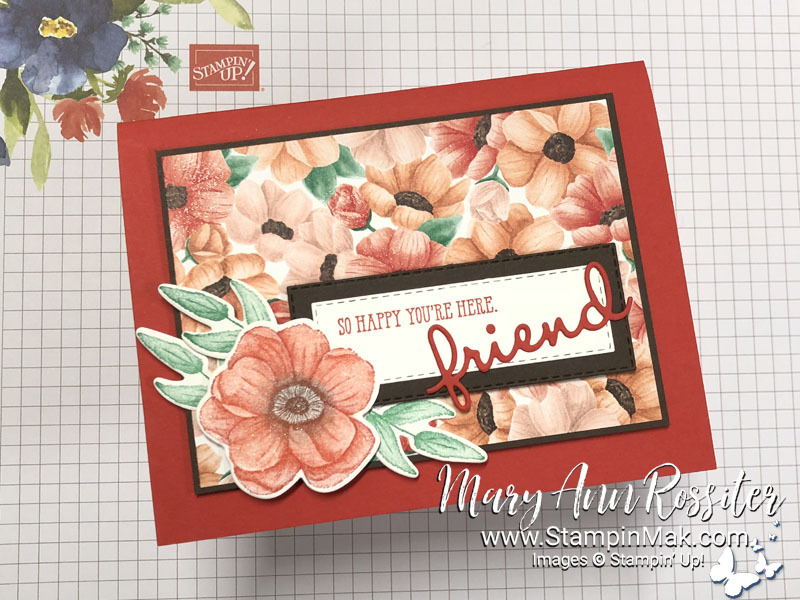 We are Stampin’ Up! demonstrators all across the U.S. and Canada. Most of us haven’t met in person, but love Stampin’ Up and want to share with you! Please join us on the 1st Friday of every month to see what wonderful things we have created! Each month we’ll have a different theme! This month it’s Ring in the New Year! I was pretty excited about this one because I wanted to create something using a technique we were reminded about at the most recent Stampin’ Up! 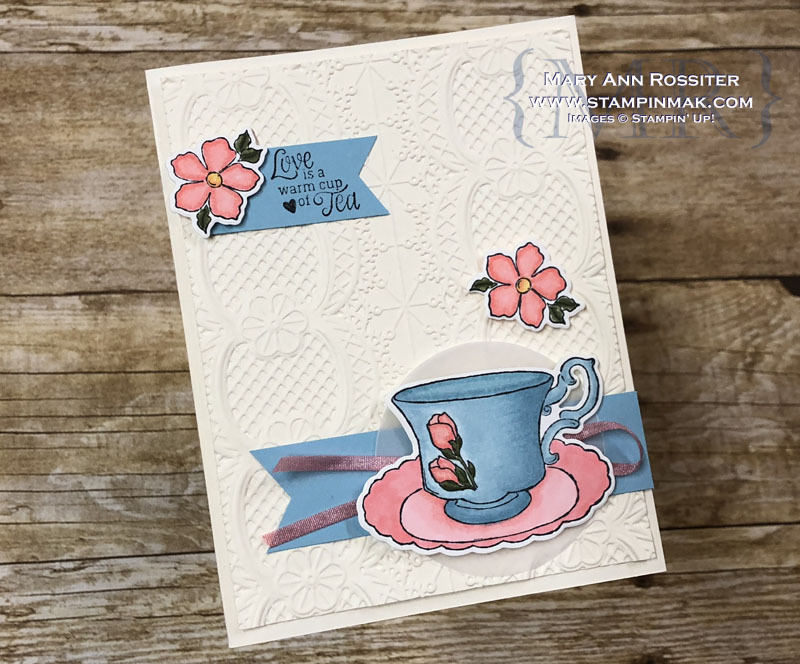 OnStage event – Simple Stamping!! It sounds silly, but it really was hard to do! Imagine getting back to the roots of stamping: Stamp, paper, ink. Sounds simple right? Well, I guess I need more practice since I decided to use my Big Shot. 🙂 And, I love how it turned out! 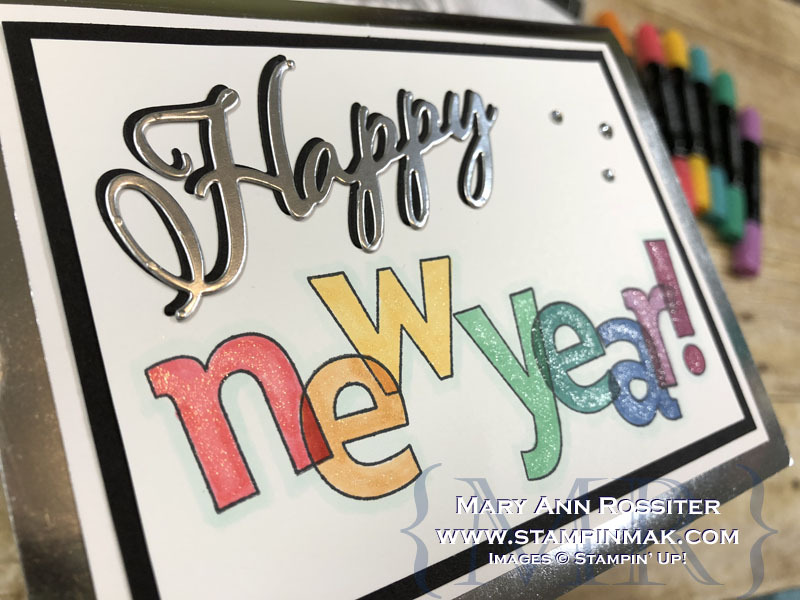 I started with the Silver Foil-Edged Cards and Envelopes, then layered Basic Black and Whisper White Cardstock to get a simple easy layered card with some shine to it. I die cut the “Happy” from the Merry Christmas Thinlits in Silver Foil and Black cardstock. Both the thinlits and the Silver Foil-Edge cards are in the Holiday Catalog – so they will be gone soon (click here to get them now while you still can). From the Annual Catalog, I used the Lined Alphabet stamps with Memento ink. 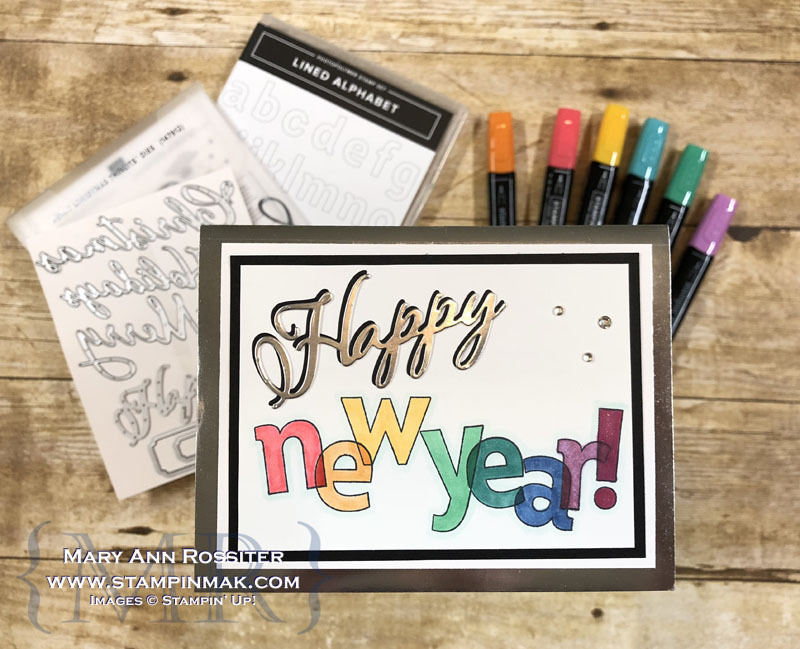 I overlapped the letters and colored them in with various colors of the Stampin’ Blends. I outlined them in Light Pool Party to make it look like a shadow. I colored some Wink of Stella all over the letters so they all sparkle with the rhinestones added. I hope you liked my take on Ringing in the New Year with some *almost* simple stamping! We are doing something a bit different now with navigation for our hop, so please make sure to check out the other fabulous entries in this month’s hop by clicking on the frog button below!! We would all love to read your comments, and thanks for stopping by!